We have just come back from a couple of days in Scotland, a whirl wind tour of two cites Dundee and Aberdeen. We go on holiday to the west coast of Scotland and never really go to the east coast, so I was really looking forward to seeing these two large Scottish cities. 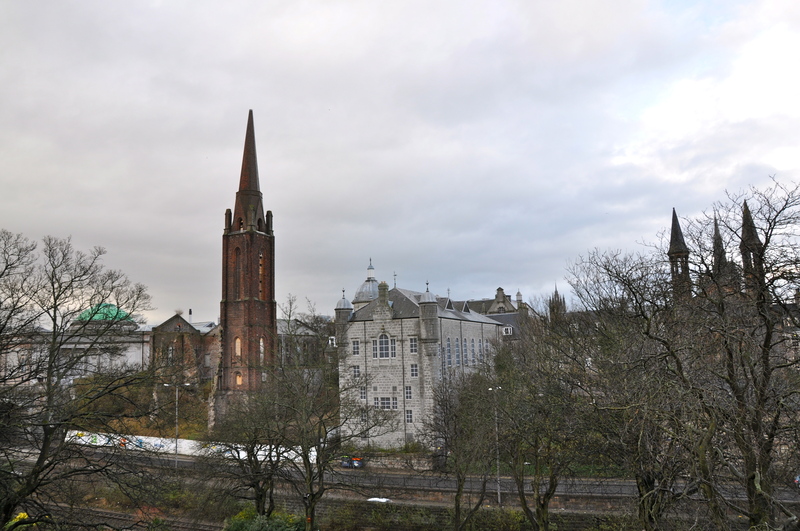 I was not disappointed, there are churches and chapels around every corner, the skyline in Aberdeen is amazing, there are spires and towers everywhere you look. The above photo was taken from our hotel room window. The above photo is of a tower, spire and ruins known as ‘The Triple Kirks’, I took this photo at about 6.30 pm, so it was beginning to get dark. I found it quite fascinating, it just stopped me in my tracks, this is in the centre of a large city and its a landmark……..but maybe not for much longer…. The Triple Kirks were three separate churches built around a common spire, together they were the size of a small cathedral and designed by Archibald Simpson in 1843. 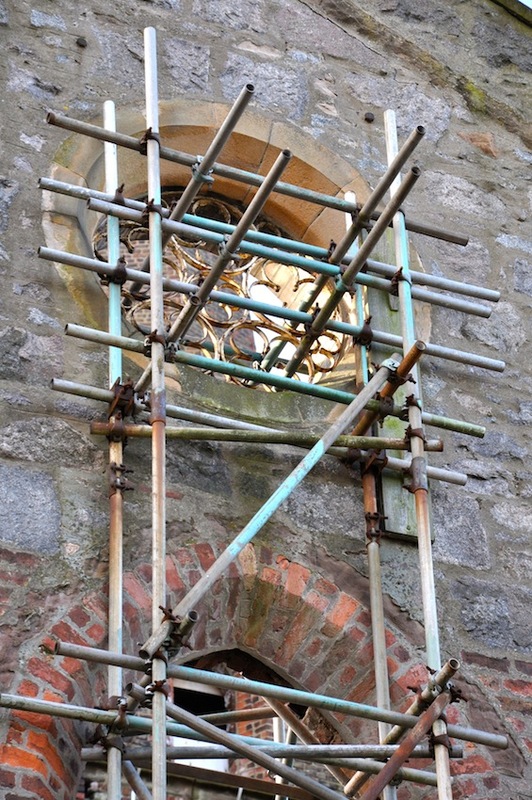 To keep the cost of the building down the bricks are believed to be recycled and at least a couple of hundred years old even in 1843. 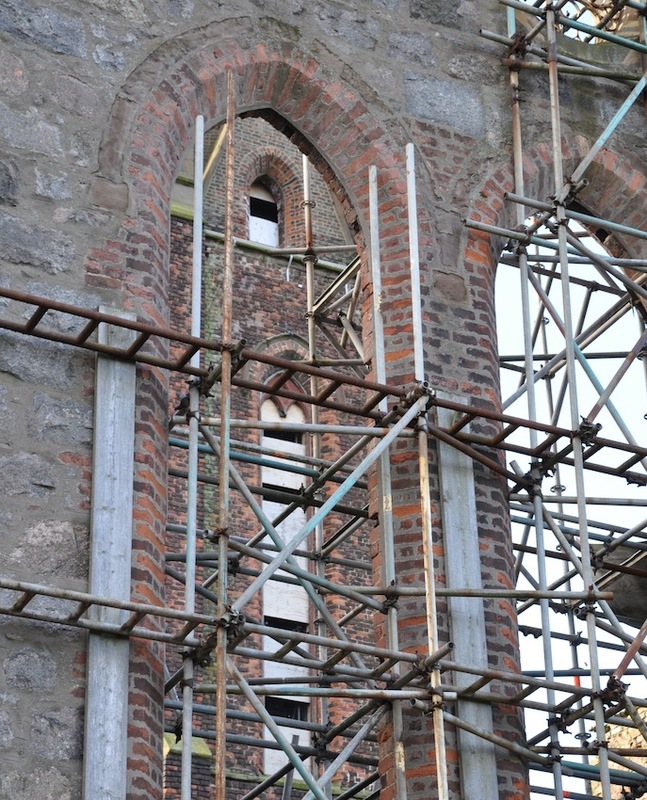 The tower is granite and sheathed in brick. 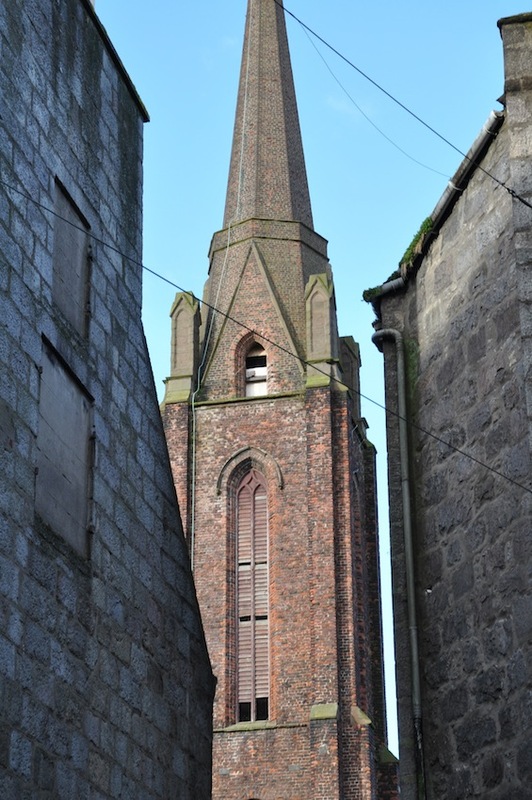 The spire can be seem from most parts of Aberdeen and is a key component in the parade of turrets, spires and towers in the skyline, this is most evident when you walk along Belmont Street. 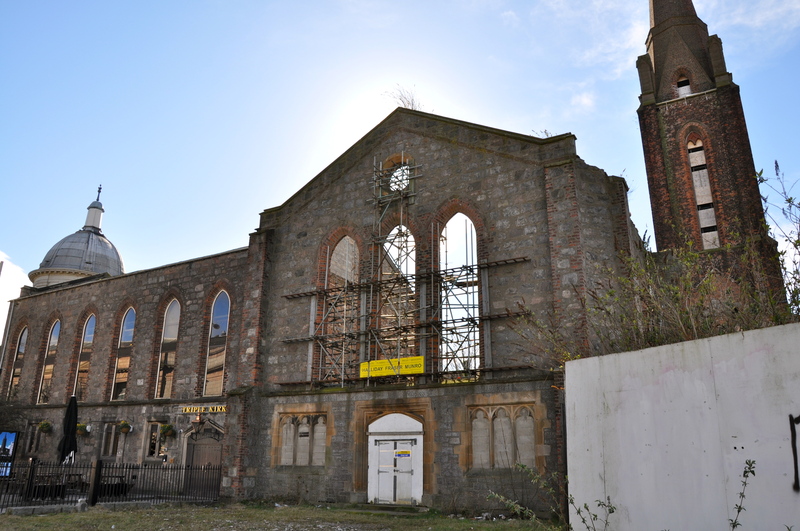 The churches fell in to disuse in the 1980’s and Barratts Builders bought the site. 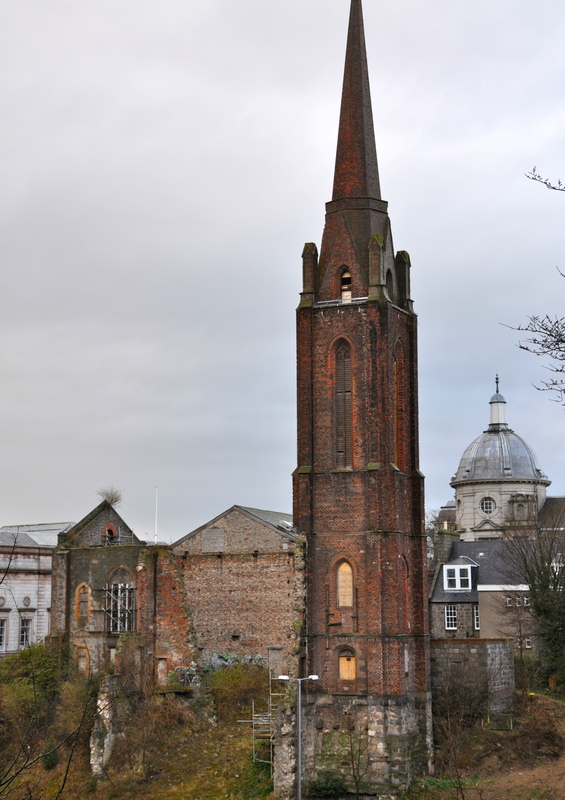 They wasted no time and put in planning permission for office blocks, luckily the Secretary of State for Scotland at the time decreed that the spire had to stay, as it was important to the skyline of Aberdeen. 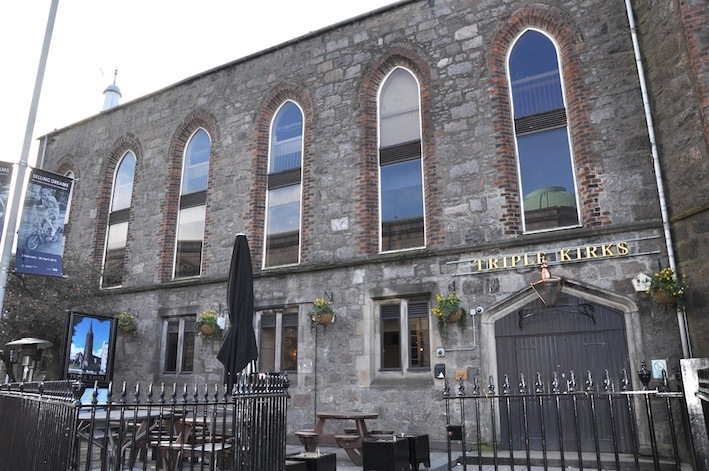 The builders got busy demolishing the churches each side of the tower & spire, but left part of the one which is now the ‘Triple Kirk Pub’. However the office blocks never got built and the site has remained as you see it now for the last 25 years……but there are plans a foot to try again. To me this plan is not in keeping with the ruins and I am just glad we came when we did, so that I saw them before they are ruined, if you get my drift. Looks like a really amazing building!! Amazing work they did back then. Aberdeen seems to have developed a habit of swamping get historic buildings with cheap office blocks. See Marishal Sq & provost skene”s house.